Ryan Finnegan, left, Dawson McCoy won first and second place, respectively in the salsa contest at the Mexican Chip Dip Competition presented by the Boulder City Elks Lodge on Saturday, March 3, 2018, to benefit Emergency Aid of Boulder City. Hali Bernstein Saylor/Boulder City Review Andy Anderson, left, and Robby Burnett, tied for first place in the "other" division of the Mexican Chip Dip Competition presented by the Boulder City Elks Lodge to benefit Emergency Aid of Boulder City. Tom Taylor, right, president of Emergency Aid's board of directors, presented them each with a gift card after the votes were tallied on Saturday, March 1, 2018. Hali Bernstein Saylor/Boulder City Review Ryan Finnegan, left, Dawson McCoy won first and second place, respectively in the salsa contest at the Mexican Chip Dip Competition presented by the Boulder City Elks Lodge on Saturday, March 3, 2018, to benefit Emergency Aid of Boulder City. Hali Bernstein Saylor/Boulder City Review Making sure there were enough hamburgers and hot dogs for lunch at Saturday's, March 3, 2018, Mexican Chip Dip Competition presented by Boulder City Elks Lodge 1682 to benefit Emergency Aid of Boulder City were, from left, Ken "Mugsy" Schultz, Doug Scheppmann, Bob Merrell and Brian Williams. Hali Bernstein Saylor/Boulder City Review Mike Derby, past president of Emergency Aid of Boulder City, gathers a plate full of salsa and other dips to try during Boulder City Elks Lodge's Mexican Chip Dip Competition on Saturday, March 3, 2018. Hali Bernstein Saylor/Boulder City Review Working behind the scenes to ensure Saturday's, March 3, 2018, fundraiser for Emergency Aid of Boulder City went smoothly were, from left, Helen Breeden, Mike Pacini, who served as emcee and DJ, and Kathy Scheppmann. Hali Bernstein Saylor/Boulder City Review A lunch featuring freshly grilled hamburgers and hot dogs was available to help raise funds for Emergency Aid of Boulder City at Saturday's March 3, 2018, Mexican Chip Dip Competition presented by Boulder City Elks Lodge 1682. Among those attending were, from left, Ron and Ann Slavicek and Shelly and Ed Clary. Ron Slavicek is treasurers of the Elks lodge. Hali Bernstein Saylor/Boulder City Review Andrea Finnegan, left, and Robby Burnett look at the silent auction items at Saturday's, March 3, 2018, Mexican Chip Dip Competition presented by the Boulder City Elks Lodge to benefit Emergency Aid of Boulder City. Burnett tied for first place in the "other" category. Hali Bernstein Saylor/Boulder City Review Molly Weaver and James Froseth sample a variety of salsas and dips during the March 3, 2018, Mexican Chip Dip Competition presented by Boulder City Elks Lodge 1682 to benefit Emergency Aid of Boulder City. 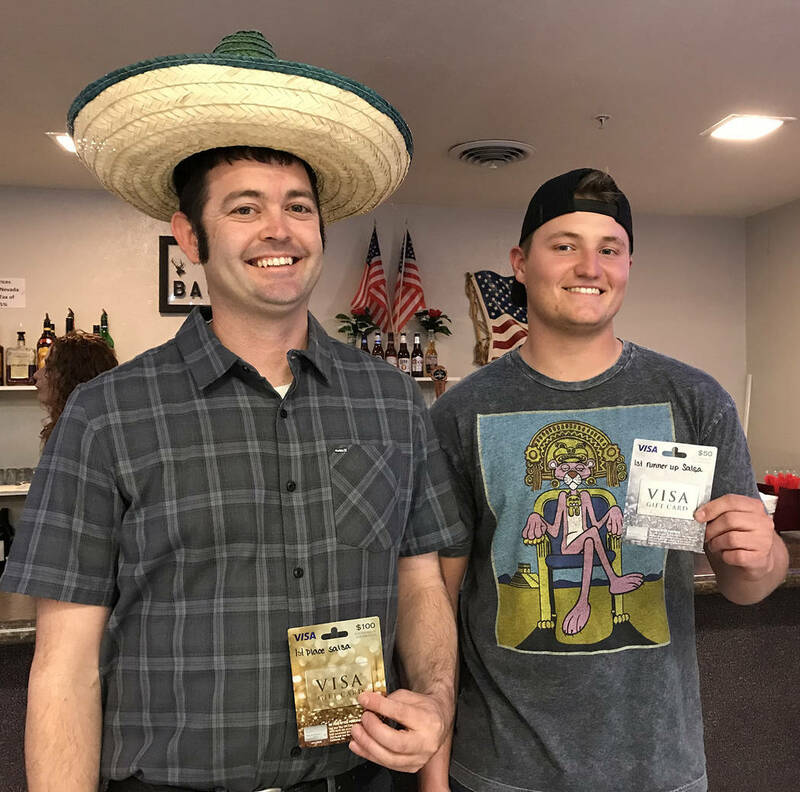 Andy Anderson, left, and Robby Burnett, tied for first place in the “other” division of the Mexican Chip Dip Competition presented by the Boulder City Elks Lodge to benefit Emergency Aid of Boulder City. 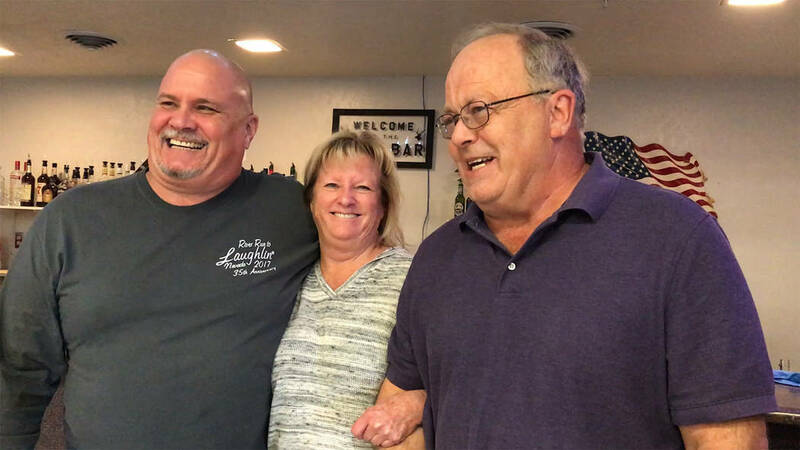 Tom Taylor, right, president of Emergency Aid’s board of directors, presented them each with a gift card after the votes were tallied on Saturday. 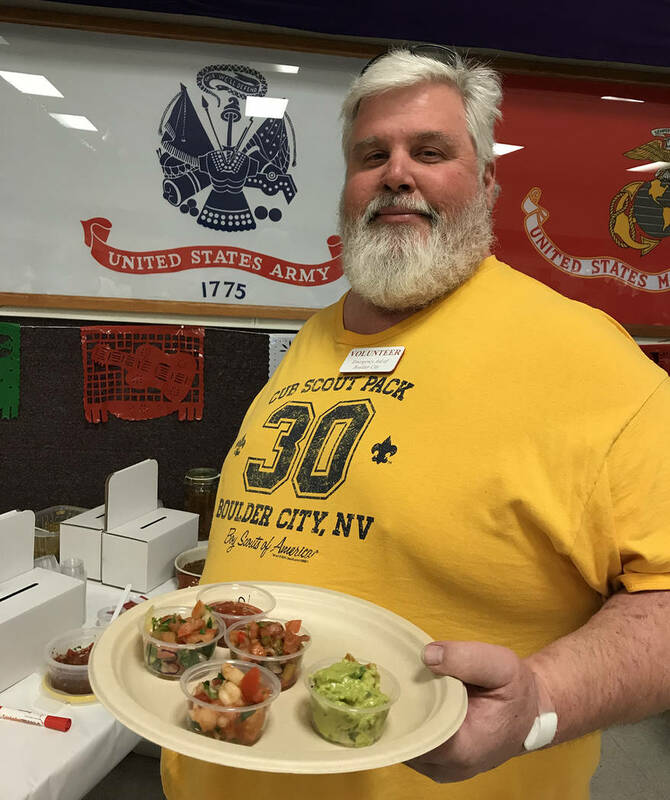 Mike Derby, past president of Emergency Aid of Boulder City, gathers a plate full of salsa and other dips to try during Boulder City Elks Lodge’s Mexican Chip Dip Competition on Saturday. 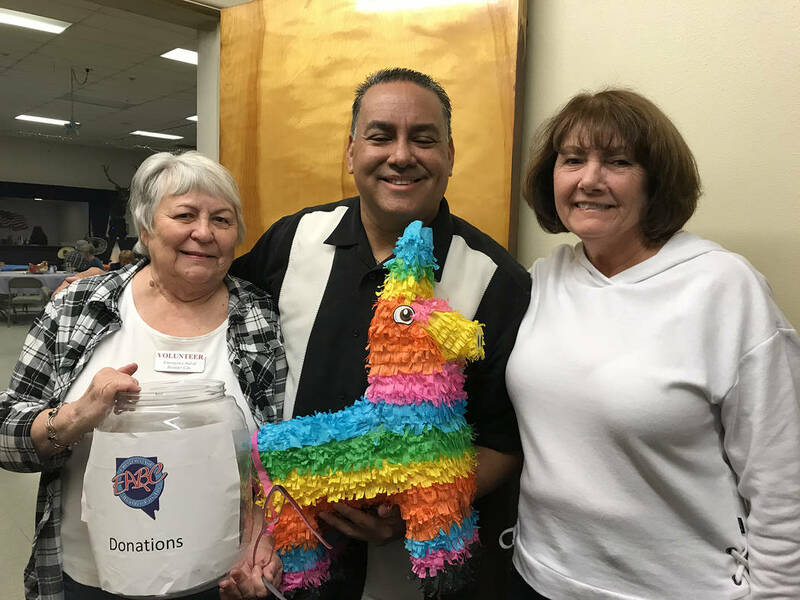 Working behind the scenes to ensure that Saturday’s fundraiser for Emergency Aid of Boulder City went smoothly were, from left, Helen Breeden, Mike Pacini, who served as emcee and DJ, and Kathy Scheppmann. 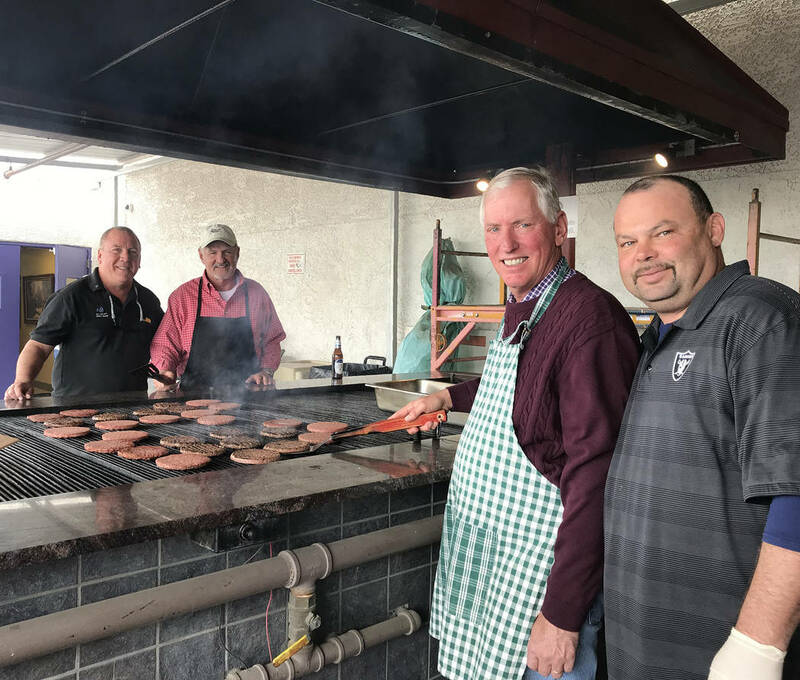 A lunch featuring freshly grilled hamburgers and hot dogs was available to help raise funds for Emergency Aid of Boulder City at Saturday’s Mexican Chip Dip Competition presented by Boulder City Elks Lodge 1682. 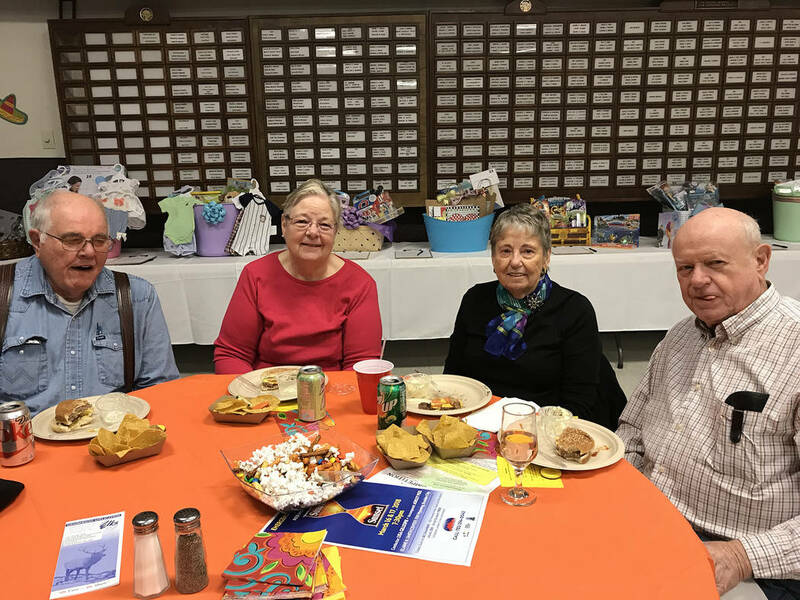 Among those attending were, from left, Ron and Ann Slavicek and Shelly and Ed Clary. 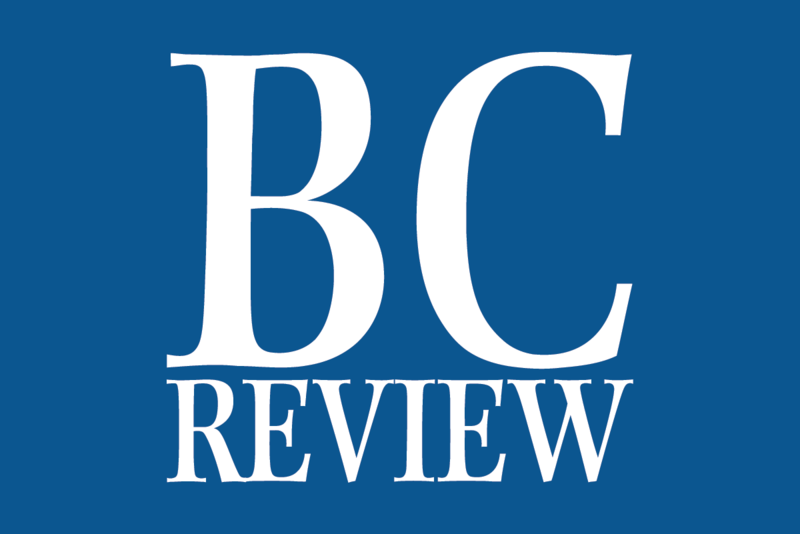 Ron Slavicek is treasurer of the Elks lodge. 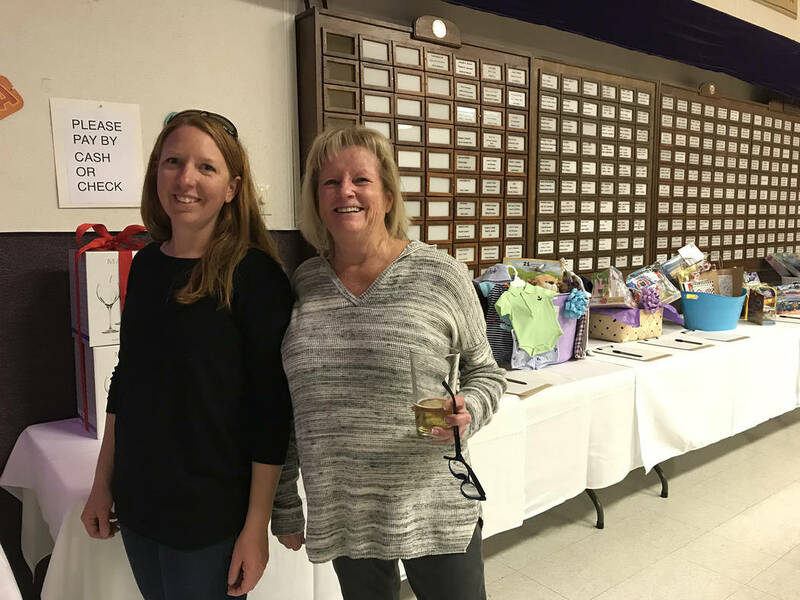 Andrea Finnegan, left, and Robby Burnett look at the silent auction items at Saturday’s Mexican Chip Dip Competition presented by the Boulder City Elks Lodge to benefit Emergency Aid of Boulder City. Burnett tied for first place in the “other” category. 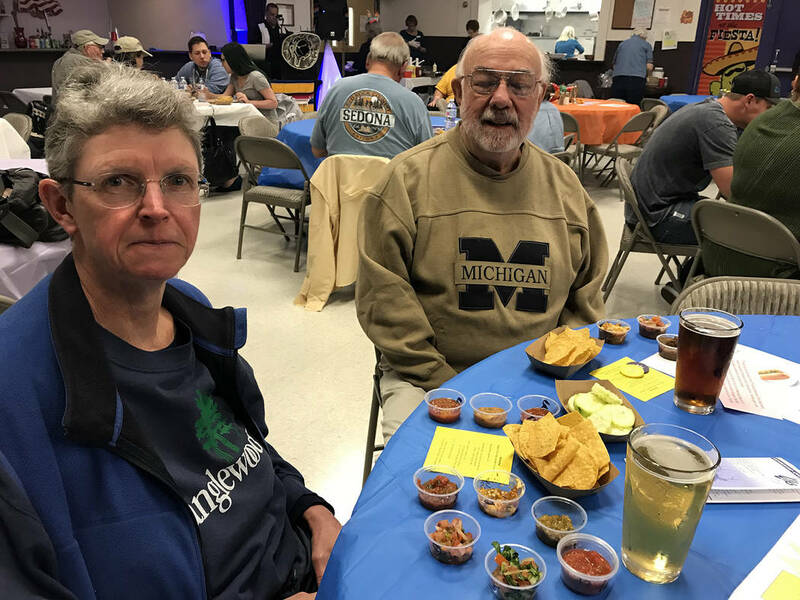 Molly Weaver and James Froseth sample a variety of salsas and dips during the Mexican Chip Dip Competition presented by Boulder City Elks Lodge 1682 to benefit Emergency Aid of Boulder City. Making sure there were enough hamburgers and hot dogs for lunch at Saturday’s Mexican Chip Dip Competition presented by Boulder City Elks Lodge 1682 to benefit Emergency Aid of Boulder City were, from left, Ken “Mugsy” Schultz, Doug Scheppmann, Bob Merrell and Brian Williams.